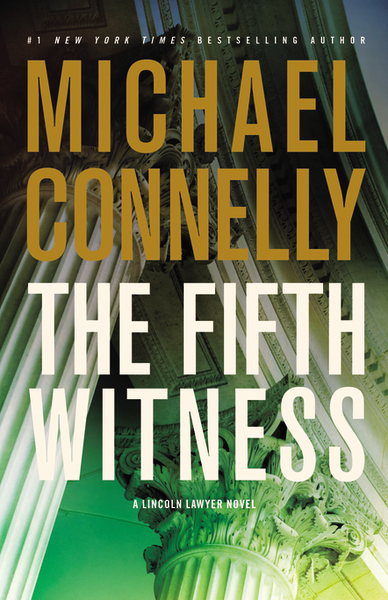 Michael Connelly’s new legal thriller starring Mikey Haller, The Fifth Witness, hits bookstores today. Here, Connelly discusses the perils of writing about a defense attorney, the source of his courtroom knowledge and the connection between Mikey and Matthew McConaughey. Question: Michael, in The Fifth Witness, we learn that times have been tough for criminal defense attorney Mickey Haller causing him to expand his law practice into foreclosure defense. One of his foreclosure clients gets accused of killing the banker she blames for trying to take her home. Why did you decide to tackle the tricky subject of foreclosure in this book? Michael Connelly: Two reasons. First, I am always looking for a story that reflects a little bit of what is happening in society at the moment. And this, of course, is happening. Millions of homes have been foreclosed on in the last couple years and probably millions more to come. The second reason is that I sort of fell into it. One of the attorney’s I research the Haller books with has done the same thing. Because the economic downturn has resulted in fewer clients being able to hire private defense counsel, he moved into foreclosure defense. He told me some stories about this side of the legal trade and I knew there was a story there. Q: Here is a Mickey quote from the book: “When you come from the criminal defense bar, you are used to being despised.” Do you find it hard to create and maintain a series character who works in a profession that some people just don’t understand and often find sleazy? MC: Absolutely. But it’s a two-sided coin. On one side there are readers who love watching a guy who is good at gaming the system. On the other, there are readers looking for a hero. So the difficulty is finding stories and situations where Mickey sort of speaks to both of these constituencies. Reading to me is about creating an empathic connection with a character. The challenge in accomplishing this as a writer is more difficult when that character, as you say, is often misunderstood and generalized as sleazy. It is so much easier to build a connection between the reader and a detective like Harry Bosch. Q: In The Fifth Witness, Mickey says: “It doesn’t matter if our clients are guilty or innocent. They all get the same bang for their buck.” In the book, Mickey’s new young associate questions this philosophy and Mickey has to educate her about the reality of criminal defense. Was this your way of explaining and supporting Mickey’s work with your readers? MC: I definitely set up the character of Jennifer Aronson as the conscience of the story. She is young and idealistic. Mickey has been down the road a long way and his idealism has been eroded with cynicism. Jennifer is there to remind him of the way things should be. In a way she is a device I use for Mickey to explain himself and his world. Q: You really seem to nail not only the courtroom scenes but the demanding work that goes into preparing for a murder trial. Since you don’t have a law background, how do you pull this off? And what kind of feedback do you get from lawyers about these books? MC: I ask a lot of questions. I used to be a newspaper reporter and covered courts for a while. It gave me a basic understanding of procedure. But I spend a lot of time with lawyers and cops and I try to get it as right as possible. Overall, the reaction is very good from people in the law trade. But not everything is exacting in the law. I frequently hear from lawyers who say they would go different ways or employ other means. It doesn’t mean I got it wrong. There are just different ways within the law to get from A to B.
Q: When we first met Mickey Haller in The Lincoln Lawyer, he was working alone on small time cases out of the back seat of his car. In the most recent book, The Reversal, Mickey temporarily switched sides and acted as a special prosecutor. In The Fifth Witness, he is back to defense work but he has hired an associate fresh out of law school and gets a temporary office. It would seem that things are always changing for Mickey. Why do you prefer to evolve your characters book-to-book? MC: It’s the only way to keep him alive. Characters can’t be static from book to book. I always want to change things up. In fact, at the end of The Fifth Witness there is another change and Mickey’s off in a new direction I hope to explore the next time I write about him. Q: Did the experience of seeing your Mickey Haller character brought to life on film by Matthew McConaughey change the experience of writing him? MC: Not really. I think McConaughey is excellent as Mickey Haller but I think his character is embedded pretty deeply in my imagination so I can still write him without distraction. Q: So, what is coming next, after The Fifth Witness? MC: I’m having a busy year and I am currently writing a book called The Drop, which is a Harry Bosch novel. Harry is handling two cases at once, a cold case that turns hot, and the politically charged investigation into the death of a city councilman’s son. The city councilman happens to be Harry’s old nemesis, Irvin Irving. I hope to get the book finished in time to be published this fall. Michael Connelly is a former journalist and the author of the #1 bestsellers The Scarecrow, The Brass Verdict and The Lincoln Lawyer the bestselling series of Harry Bosch novels, and the bestselling novels Chasing the Dime, Void Moon, Blood Work, and The Poet. Crime Beat, a collection of his journalism, was also a New York Times bestseller. He spends his time in California and Florida. Learn more at www.michaelconnelly.com, follow him on Facebook and read the first six chapters of THE FIFTH WITNESS online at Scribd.com.